After the terror of ISIS, returning home is still a distant prospect for thousands of Yazidis. Now they have become pawns as Baghdad and Erbil bicker over their homeland of Sinjar. On the morning of May 12, black smoke rose from the flatlands to the south of Mount Sinjar, a rugged ridgeline in northern Iraq that stretches towards the Syrian border. Since the jihadists of the self-proclaimed ‘Islamic State’ (IS, or ISIS) stormed into the Sinjar area almost three years earlier, killing and enslaving thousands of Yazidis and forcing the rest to take flight, the land to the south of the mountain had been a desolate place of lingering horror. They told us to trust them, that they would protect us. But when Daesh came, they abandoned us. But now, the plains stirred. Shia militias, known in Iraq as the Hashd al Shaabi – the Popular Mobilisation Forces – were streaming into the area in long columns of pickup trucks. Under the covering fire of heavy machine guns, the militiamen began their offensive by attacking the IS-held villages to the southeast of the mountain. The fanatical insurgents drove suicide car bombs into the lines of their encroaching enemies, but failed to stop the advance. Within a few weeks, militias had reached the Syrian border to the west, in the process expelling the extremists from Sinjar. Their defeat of ISIS in Sinjar gained the Hashd al-Shaabi the respect of the displaced Yazidi population – and shuffled the cards of the political poker game over Sinjar afresh. Suddenly, the crumbling ‘Islamic State’ had been replaced by a powerful militia allied to the central government in Baghdad and a stated enemy of Kurdish territorial ambitions. The Yazidi homeland of Sinjar is part of a swathe of disputed territory stretching all along the autonomous Kurdish region in northern Iraq that both the Kurdistan Regional Government (KRG) and Iraq’s central government lay claim to. The KRG regards Sinjar as Kurdish territory that wrongfully fell to Baghdad after the end of Saddam Hussein’s regime in 2003. After the Iraq War, the Kurdistan Democratic Party (KDP) took control of the Sinjar region through the clever manipulation of the local elections – while most Yazidis speak a Kurdish dialect, they do not necessarily identify as Kurds. And although Sinjar is in the Iraqi province of Nineveh and Yazidis outnumber Kurds and Arabs there, the Kurdish government in Erbil soon held sway over the area. Sinjar is part of Iraq, and we will do everything to ensure it will remain part of Iraq. Sinjar is also entangled in Kurdish aspirations for independence, which received a huge boost from the war against ISIS. Sensing an opportunity, president of Iraqi Kurdistan (and KDP head) Masoud Barzani has scheduled a referendum for September 25 on whether the KRG should remain part of Iraq. The contentious referendum is set to be held in the parts of the disputed territories that are under Kurdish control. These include Sinjar, at least partially. A resounding ‘yes’ to secession would strengthen Barzani’s hand in future independence negotiations, and the Kurdish claim to the disputed territories. But the Kurds will have to content with the Hashd al-Shaabi in Sinjar, who firmly oppose the break-up of Iraq. “Sinjar is part of Iraq, and we will do everything to ensure it will remain part of Iraq,” declares Ali Kaabi, a spokesman for the militia group. Resistance to KDP hegemony is also stirring among the Yazidis, who have not forgotten how the party failed to prevent the disaster that befell them three years ago. When ISIS surged into Sinjar on August 3, 2014, thousands of Kurdish militiamen, known as the Peshmerga, were stationed in the area. But instead of mounting a defence, they fled without firing a shot, abandoning the Yazidis to a grim fate. “They told us to trust them, that they would protect us. But when Daesh came, they abandoned us,” remembers Qasim Shevan, a Yazidi sheikh who leads a group of men armed with rusty Kalashnikovs and World War II-era rifles. His men fought desperately to defend Mount Sinjar, where tens of thousands of Yazidis sought refuge from the jihadists who rolled onto the plains of Sinjar unopposed. Salvation came from across the border. The People’s Protection Units (YPG), a Kurdish militia from Syria affiliated with the Kurdish Workers’ Party (PKK) in Turkey, crossed into Iraq and broke through the ISIS encirclement to establish a corridor that allowed the Yazidis to escape to safety. With this crucial intervention, the PKK established a lasting presence in Sinjar. YPG and PKK fighters remained in the area and established the Sinjar Resistance Units (YBS), a Yazidi PKK militia. The Peshmerga had pushed ISIS back from the northern part of Sinjar Province by December 2014, and took the eponymous city on the southern foot of the mountain with the help of PKK fighters and air strikes by the US-led coalition a year later. But the Marxist guerrillas stayed put, a thorn in the side of the KDP. The YBS’s most potent recruitment tool has been the Peshmerga’s failure to protect the Yazidis from the jihadists’ genocidal attack. The arid farmland surrounding abandoned Yazidi villages is pockmarked with unmarked graves filled with the bones of men and old women murdered in cold blood and buried in shallow pits by the jihadists. The UN estimates that up to 5,500 Yazidis were murdered by ISIS, mostly men. A further 6,386 members of the religious minority were kidnapped, mainly women and children. ISIS regards the Yazidi faith as devil worship, and its followers a bounty of war. Thousands of Yazidis were forced into sexual slavery, given as a bounty to ISIS fighters and sold on slave markets. Many remain in captivity. Around ninety percent of the roughly 360,000 Yazidis in Sinjar remain displaced, about half of them living in squalid displacement camps in the nearby Kurdish autonomous zone. The ISIS onslaught drove thousands of Yazidis into the ranks of the militias. Some of the Yazidi sheikhs stuck with the KDP, and their followers were incorporated into the Peshmerga command. Because the KDP controlled the only access points into Sinjar from Iraqi territory and their families had fled to Kurdish territory, many men saw joining the Peshmerga as the only way to fight ISIS and receive a moderate income. 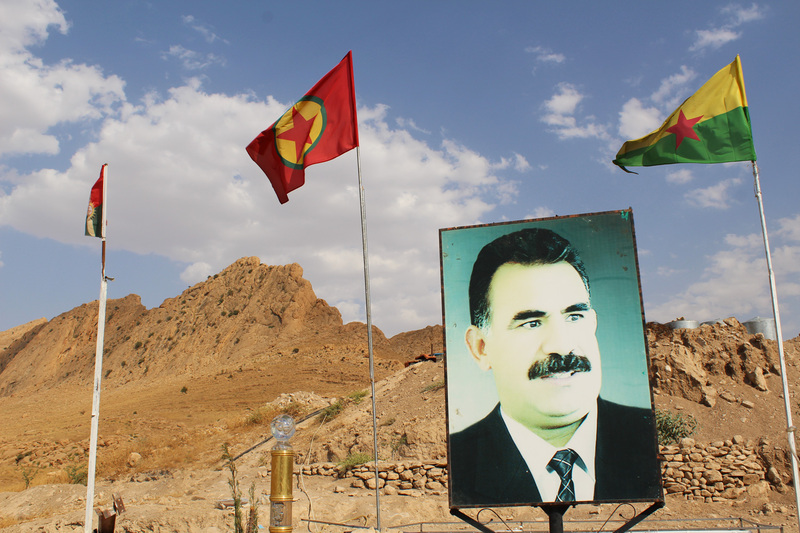 Gratitude for its daring rescue mission helped the PKK recruitment drive for the YBS, but its Marxist ideology limited its appeal in the conservative Yazidi community. Hundreds of men stayed loyal to independent sheikhs like Qasim Shevan, who joined neither the Peshmerga nor the YBS. Shevan and his men remained camped out in tents that cluster a plateau on Mount Sinjar and house around 8,000 displaced Yazidis. This spring, looking down from a ragged mountain ridge that rises from the plains like a dragon’s spine, Shevan and his men observed the advance of the Shia militias in the flatlands below. Friends and family languishing in displacement camps were quickly alerted, and the news spread through the community like wildfire. After almost three years, the terror group was being kicked out of Sinjar for good. The success of the Hashd al-Shaabi set in motion an important realignment of Yazidi forces. Even before the guns fell silent in south Sinjar, many Yazidi leaders decided to join the militias on the plains. One was Naif Jasso, among the few survivors from Kocho, a village on the southern fringe of Sinjar. Kocho was one of the first villages the jihadists reached when they launched their 2014 attack. Swiftly surrounded, the villagers were forced into negotiations with the encroaching insurgents. Ahmed Jasso, the village elder and Naif’s brother, surrendered the village after he was promised that its inhabitants would be given safe passage to Mount Sinjar. But the jihadists did not keep their word. Under the pretext of transporting the men to the mountain, small groups were driven off in trucks and massacred in roadside ditches and nearby farmhouses. At least 380 Yazidis were butchered that day; their bodies still lie in mass graves on land their families had tilled for generations. The women were herded into the school building at the edge of the village and trucked off into slavery. Only a few women managed to escape, and some were later ransomed. One who got away is Nadia Murad, who has gained worldwide fame as a UN Goodwill Ambassador championing the Yazidi cause. A group of around eighty elderly women were driven to a pit near the town of Sinjar and shot. Naif Jasso, who survived because he was not in Kocho on August 3, gathered a group of several hundred fighters and joined the Peshmerga. But since the Kurds did not advance beyond the foot of the mountain, Jasso was given no opportunity to retake his ancestral village in the south. That changed with the arrival of the Hashd militia, and Jasso wasted little time in joining the militias, allowing his ‘Land of the Yazidis’ battalion to join the fight for the village. “I am from Kocho, and I was desperate to take part in the liberation. It was a beautiful day,” Jasso told zenith afterwards. He has also aligned himself with the Hashd for political reasons. While the Shia militias are often trained, equipped and advised by Iran’s Revolutionary Guards, they are also the only powerful group representing Baghdad in Sinjar. The central government is keen to reduce the KDP’s sway and regain control over the area. That is also in the interest of many Yazidis. Feeling let down by the KDP and its armed forces, Yazidis sheikhs such as Jasso are striving for self-governance and control over their own security arrangements. “We want Sinjar to become its own province, and for it to remain part of Iraq,” Jasso says during an interview in Tel Kassab, an abandoned village in southern Sinjar which serves as a base for his battalion. Qasim Shevan also joined the Hashed, leaving the mountain to link up with the militias on the plains. “The south of Sinjar was controlled by Daesh for too long. Finally, the Hashd al-Shaabi came and liberated our places. They fought under the Iraqi flag. It is in the interest of the Yazidi people to join the Hashd,” he says. KDP intimidation against Yazidis who align with any political competitor of the KDP is widespread, systemic and ongoing. The Hashd know that the Yazidis are keen to provide for their own security in future, and have been quick to play to the minority’s desire to take matters into their own hands. In a newly constructed boot camp near Tel Kassab, Yazidis that have made their way through the Peshmerga lines are already being trained. From these recruits, new battalions will be raised to safeguard the area. “There will only be Yazidi Hashd units in Sinjar in future,” promises Kaabi, the militia spokesman. According to Shevan, over 3,000 Yazidis had joined the Hashd by July, and there would have been more if Kurdish security forces did not try to prevent them from crossing into Hashed territory. Despite Kurdish efforts, men keep trickling in, he says. We hope that the Peshmerga understand that they have to leave the area eventually. The KPD continued to act against the interests of the Yazidi community even after the fateful events of the summer of 2014. Alarmed by the popularity of the PKK, the party prevented supplies of food, building materials and fertilisers from entering Sinjar from the Kurdish region. The few farmers that returned to the liberated parts of Sinjar were prevented from selling their crops and livestock outside the area. The blockage, which was only eased earlier this year, was an attempt to undermine the PKK in Sinjar by limiting supplies and potential recruits. It was also intended to send a message to the Yazidis in Sinjar: With the PKK around, there will be no reconstruction and no way to make a living. Barber believes the blockage was also put in place to prevent a return of the displaced Yazidis, as the KDP feared this would hand the area to the popular PKK. 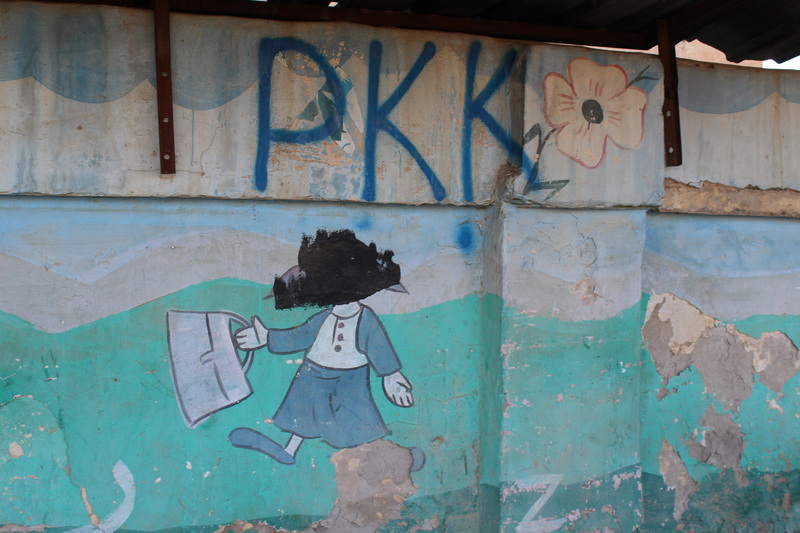 A town marked by conflict: ISIS defaced the murals of this primary school in Sinjar city, PKK fighters tagged their affiliation on the wall after they helped take the town from the terror group. 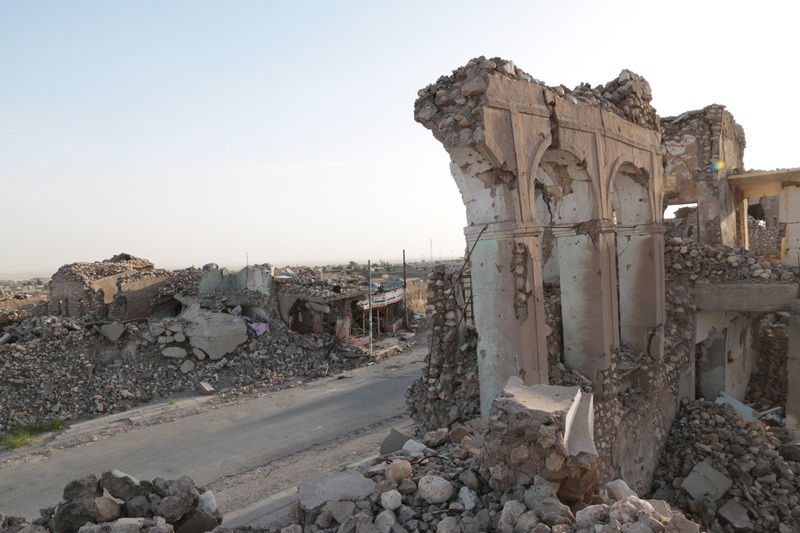 The cynical attempt to undermine its political rivals at the expense of the Yazidis runs counter to efforts of international organisations such as the German government's development agency GIZ to enable a return of the local population through reconstruction of the heavily destroyed area. It is also a further reason against voting for independence in the September referendum and so strengthening the Kurdish claim to Sinjar. Nevertheless, Pro-KPD Yazidis remain bullish on the referendum. “It is a hundred percent certain that Sinjar will be part of Kurdistan. Everyone will vote for it because nobody helped us except Barzani,” says Qasim Semer, a Yazidi KDP member who works in Sinjar as an advisor to the Peshmerga. But it is more likely that the KDP, which rules supreme in the western part of the autonomous zone, will fall back on tried and tested methods to coerce the right result out of the displaced Yazidis. The intimidation of Yazidis who defy the will of the party has long been commonplace, according to Barber, with Kurdish security forces harassing and imprisoning opponents. “KDP intimidation against Yazidis who align with any political competitor of the KDP is widespread, systemic and ongoing,” says Barber, who worked with Yazda in Iraq and has close ties to the community. 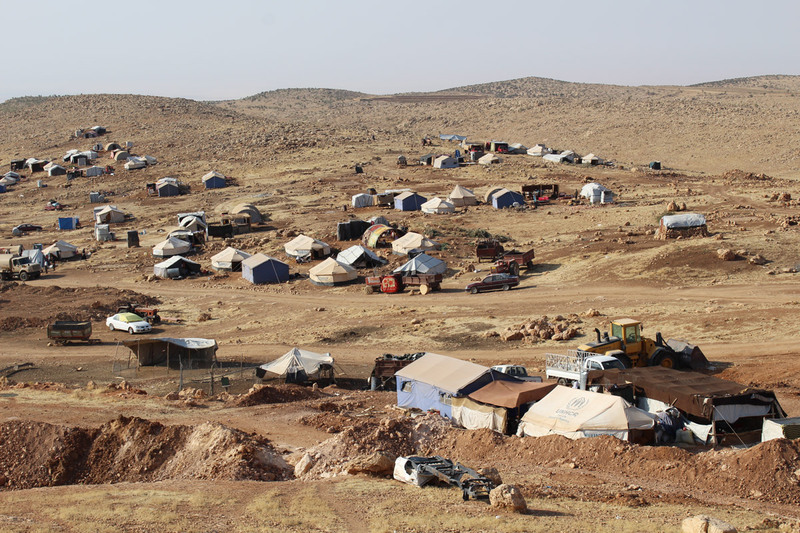 Yazidis living in displacement camps in Kurdish territory are particularly vulnerable to coercion. Should the referendum results support Kurdish territorial claims in Sinjar, tensions between the Kurds and the Hashd could boil over. The Shia militias insist that the Kurds have no reason to be in Sinjar, and expect them to leave sooner rather than later. “We hope that the Peshmerga understand that they have to leave the area eventually. Otherwise there might be clashes between them and us,” says Kaabi. Sheikh Shevan hopes the Yazidis will stay out of any fighting between the Shia and the Kurdish militias, but he concedes that open conflict between the two most powerful actors in Sinjar would further dampen the prospects of a return of his people. 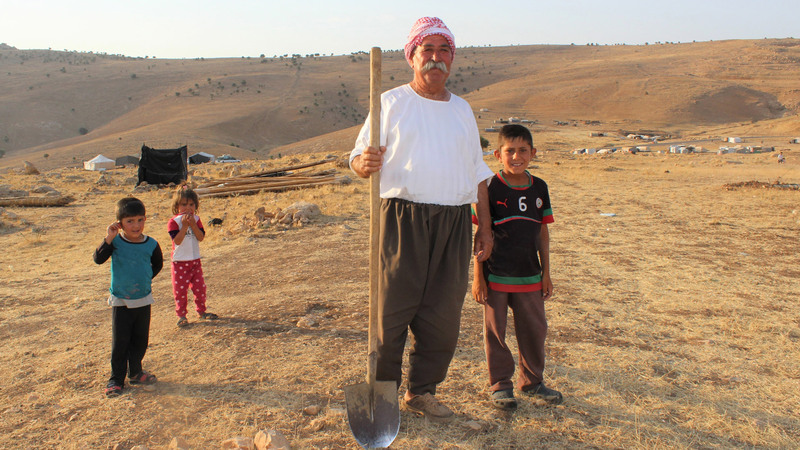 The Yazidis are already the losers as outsiders tussle for their land. Before the Hashd put an end to the ISIS presence in Sinjar, fear of the jihadists and tensions between the Kurdish groups prevented a return of the displaced. Now, renewed tensions keep them marooned in the camps. The frontline that the Kurds established after their last offensive in 2015 is now a fault line cutting right through Sinjar. Even if the guns remain silent along the trenches and earthen berms, the old frontline threatens to become the new border tearing the Yazidi homeland apart.